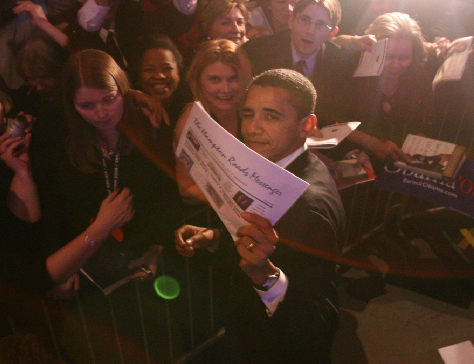 Seen here, President Obama holds up an early edition of the Hampton Roads Messenger. The Messenger was established in 2006 to provide news and information to empower people of all cultures in Hampton Roads. Our goal is to encourage more people living in Hampton Roads to become entrepreneurs by providing the necessary mentors, contacts and tools. We feature business owners and introduce their products and services to our readers. Economic development in Hampton Roads is our primary focus because we believe that as a geographical area prospers, so shall its residents. The Hampton Roads Messenger is a Messenger Media Company.